In the midst of his myriad attacks on women, Boehner somehow has the time to also go after gay marriage. 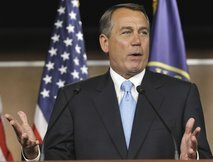 House Speaker John Boehner says he’s launching a legal defense of the federal law against gay marriage. The Ohio Republican announced Friday that he was convening a bipartisan legal advisory group to defend the Defense of Marriage Act, which defines marriage as a union between a man and a woman. President Barack Obama has refused to defend the law signed by President Bill Clinton in 1996. I can’t say I’m surprised. Disappointed, yes. Surprised, no. In closing, I’d like to say: WHAT ABOUT THE ECONOMY, BOEHNER?! WHAT ABOUT JOBS?! While it’s great that you, as a wealthy, White male politician, have a job and are not suffering in this economy, I can’t say the same for many Americans. Stop worrying about my uterus and whether guys are holding hands and CREATE JOBS.